NOTE: Text, photographs and graphics by Asitha Jayawardena (http://uk.linkedin.com/in/asithaj) as part of his Sustainable University One-stop Shop Experiment (http://www.sustainableuni.kk5.org/), which is recognised in UNEP Greening Universities Toolkit (http://www.sustainabilityexchange.ac.uk/files/unep_greening_university_toolkit-final-small_size.pdf page 61). 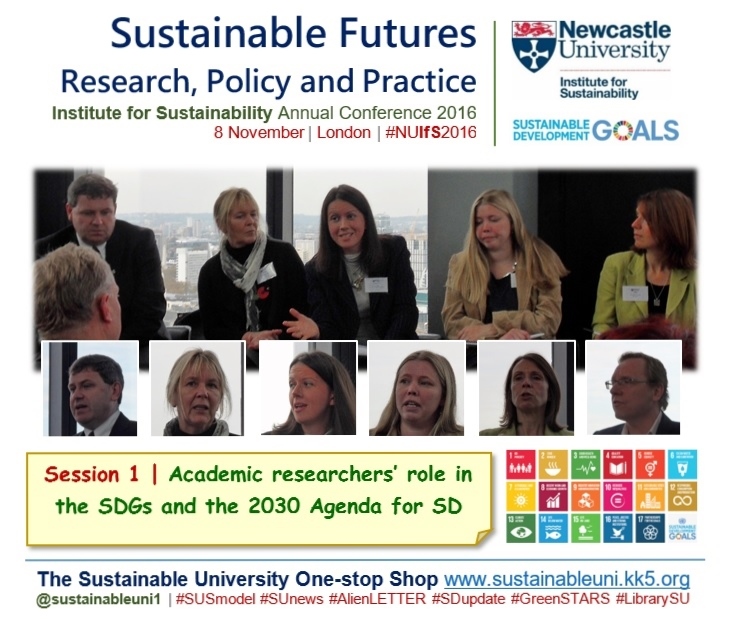 Public engagement could be an effective way of promoting policymakers’ uptake of sustainability research findings, said several speakers in the annual conference of Newcastle University’s Institute for Sustainability (IfS) held in London on 8 November 2016. 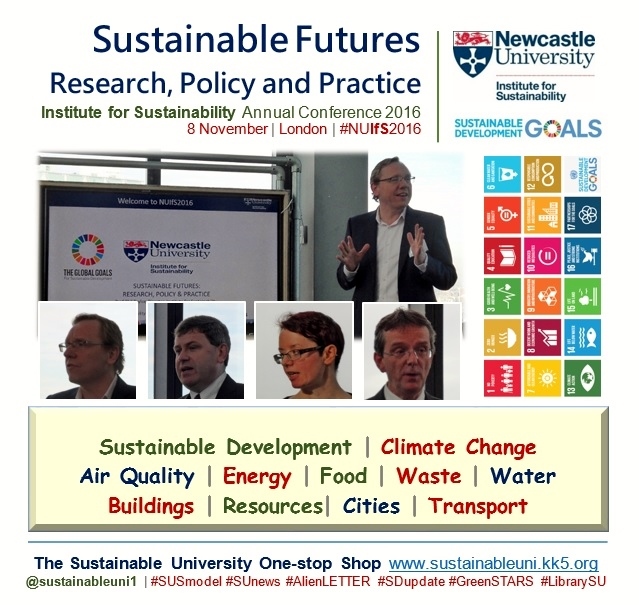 Titled ‘Sustainable Futures: Research, Policy and Practice’, this annual event focused on research, policy and practice that would help achieve the UN Sustainable Development Goals (SDGs), exploring the challenges in sustainability research at a range of scales – regional, national and international – with a view of enhancing collaboration among academia, industry, policy and the public. Session 1: What is the role of academia in helping to meet the SDGs and where should they have input in the 2030 Agenda for Sustainable Development? Welcoming the participants to the dizzy heights of the 32nd floor of the building, Professor Phil Taylor (Director, Institute for Sustainability, Newcastle University), provided an overview of the event, including its aim: To explore ways academic research in sustainability can inform policy and practice for the UN Sustainable Development Goals (SDGs), driving forward the 2030 Agenda, and to enhance collaboration between key actors in academia, civil society, industry and policy for achieving the SDGs. He also outlined the work of the university’s Institute of Sustainability (IfS), which connects academia with industry and policymakers in the context of sustainability research. Sustainability is one of the three societal challenge themes that the university is pursuing as part of its overall focus on research excellence with impact and the other two themes are Aging and Social Renewal. The IfS works on three research challenges: Integrated infrastructure systems, Production and resources, and Consumption and waste. These three challenges are underpinned by the concept of Justice and Governance, which sits at the centre of the work of the institute. It is planning to add Climate Change Adaptation and Mitigation as an overarching theme next year. The institute’s research addresses the SDGs by developing integrated approaches to energy, food, transport and water infrastructure. Notable among its research highlights is the Science Central and improving the sustainability of utilities in India in collaboration with Enzen Global Ltd. Professor Patrick Paul Walsh (University College Dublin and Senior Advisor to the UN Sustainable Development Solutions Network SDSN) delivered the keynote address on Universities and the UN 2030 Sustainable Development Agenda. The Sustainable Development Goals (SDGs) of the 2030 Agenda for Sustainable Development are universal and indivisible. They call for action by all countries and all people and active participation of all section of society is needed. Because they are linked to one another, an integrated approach is needed; working in disciplinary silos or cherry-picking would not work. In a way it is a miracle that 193 nations agreed on the 2030 Agenda in September 2015. It is not binding but a moral agreement for the 21st century, penned in a common language for all. There is a growing consensus among the UN member states of the urgent need to act on the SDGs. This agenda will pave the way for governments, the private sector, civil society and other stakeholders to act to end poverty and build a more sustainable world over the next 15 years for all people. Achieving this agenda will ensure a life of dignity for all and build greater shared prosperity so it is in everyone’s interest. Universities have a key role to play in achieving SDGs. They have a variety of means to contribute to this agenda, such as through a holistic approach to sustainable development research, the United Nations Academic Impact (UNAI), electives for undergraduates, Technology Facilitation Mechanism (TFM), e-discussions and consultations, Global Sustainable Development Report (GSDR) policy briefs, and volunteering and internships. 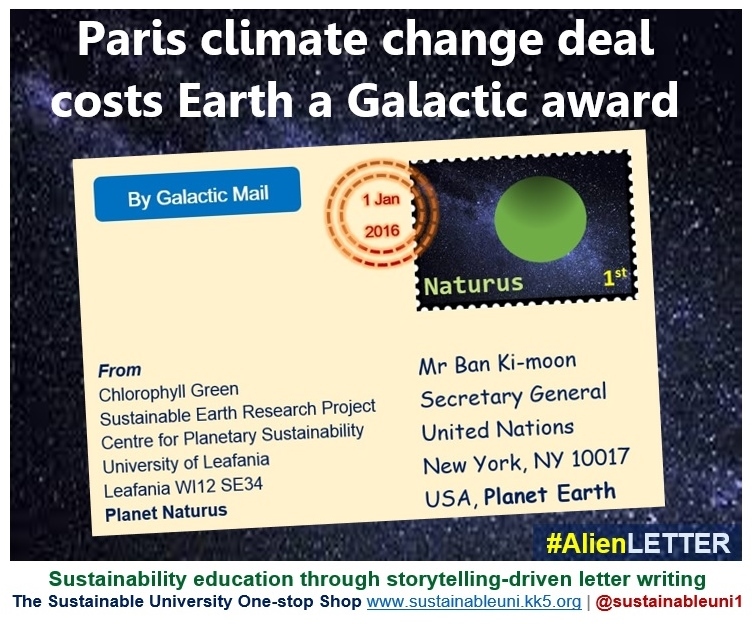 Another way to advance this is through the SDG Academy (formerly known as SDSNedu), which is an online education initiative of the Sustainable Development Solutions Network (SDSN) that provides high-quality, mass online education in the field of sustainable development. The subsequent Q&A panel comprised the four speakers and the keynote speaker. 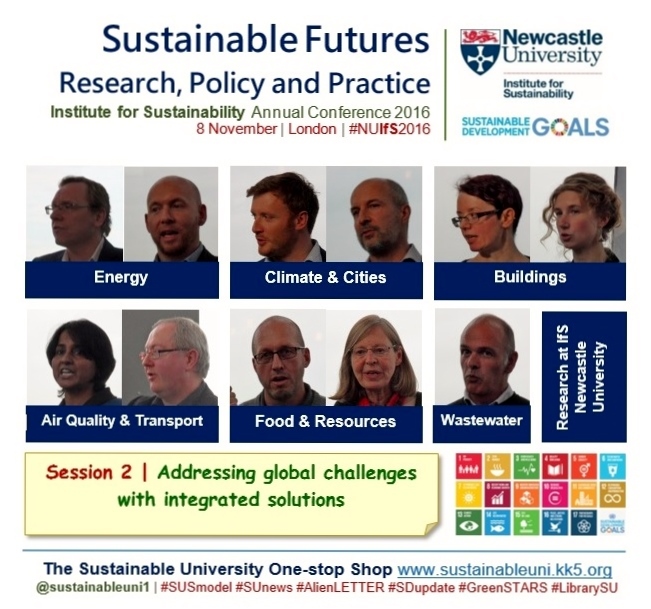 Session 2, chaired by Dr Sara Walker, was on addressing global sustainability challenges with integrated solutions and it introduced research from Newcastle University researchers. Session 3, chaired by Dr Philip McGowan (Newcastle University NU), explored how to bring research to policy for the Sustainable Development Goals (SDGs), bringing together experts in research, policy and practice to identify how academic research and demonstration can inform policy for sustainable development. The panel comprised Professor Patrick Paul Walsh ((University College Dublin and UN SDSN), Dr Graham Long (NU) Professor Phil Blythe (Department of Transport), Sue Riddlestone (Bioregional), Dr Lucilla Spini (ICSU), Dr Ruth Fuller (WWF), Dr Uma Rajarathnam (Enzen Global Ltd) and Dr Paul Goodman (NU). The following is a selection of highlights based on the panellists’ responses to the questions by the audience. Dr Rajarathnam emphasised the significance of communications and stakeholder engagement in any endeavour of advancing the SDG agenda. Dr Spini said that many academics and researchers who are not directly related to sustainability were already working on areas similar to the SDGs but they were not aware of that. She suggested that sustainability researchers should increase awareness creation on the SDGs. Professor Walsh was of the view that academia should take the lead in taking SDG Science to the private sector, demonstrating businesses its win-win potential to all. Within the broader communication and engagement sphere, engagement of policymakers received special attention. Professor Blythe stated that researchers should understand the context when communicating with policymakers, who are not research experts. He emphasised that they would like to have information that they could easily process. Based on her experience in India, Dr Rajarathnam advised that academics should go to the policymakers with solutions to specific problems instead of mere research results. Echoing the suggestion by Jenny Saunders (NEA) in Session 1, that is, academia could engage civil society as an effective way of influencing policymakers, Dr Spini said that sustainability researchers should raise policymakers’ attention level through public engagement of the SDGs. Professor Walsh said that raising the level of public understanding of the benefits of the SDGs will certainly put huge pressure on politicians to act more intensively to achieve the SDGs. As a solution to the problem that academics and researchers encounter when they present complicated research findings to politicians, Dr Spini believed that they should seek help of a translator or broker to take a simplified message through more effective media such as a film. But she said still the complicated messages should be communicated to film directors, who are again non-specialists in this area. However, she gave an example of such a science ‘translator/broker’ in London – SciDev.Net. Dr Ruth Fuller observed that achieving the SDGs requires extensive behaviour changes among people. Turning to education for sustainability, she revealed that values underpin our behaviour, so shifting the values would be the key to generating pro-sustainability behaviour. Praising the convening power of the IfS, Dr Spini asked the institute to play a leadership role, by rallying round other stakeholders in higher education and beyond around the SDG Agenda. 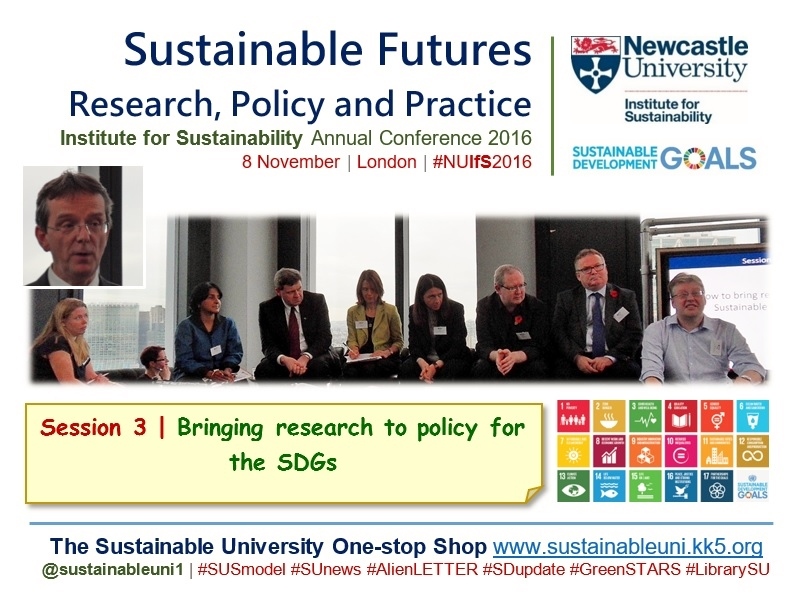 Note: Graphic of SDGs is from un.org website; logo of the IfS is from the Newcastle University website. 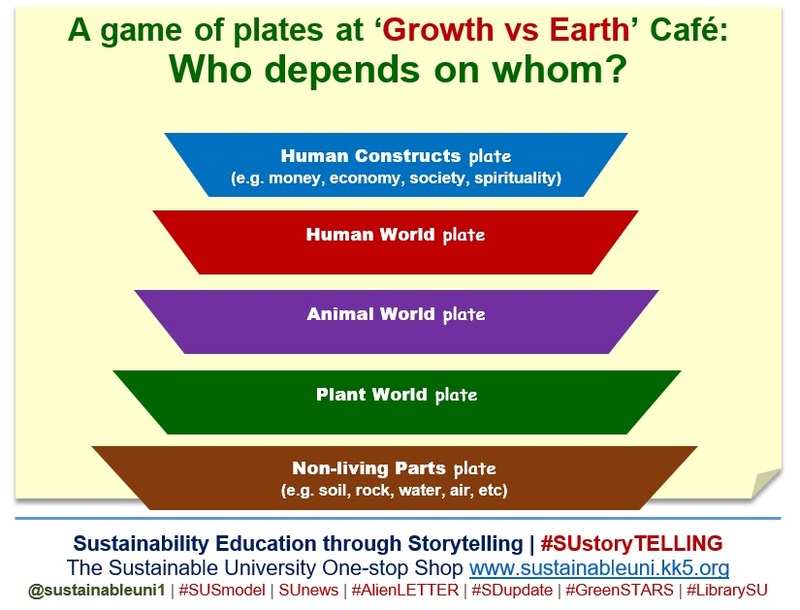 The Sustainable University (SU) News and Information website (https://sunewsinfo.wordpress.com/) celebrated its second anniversary in December 2013. 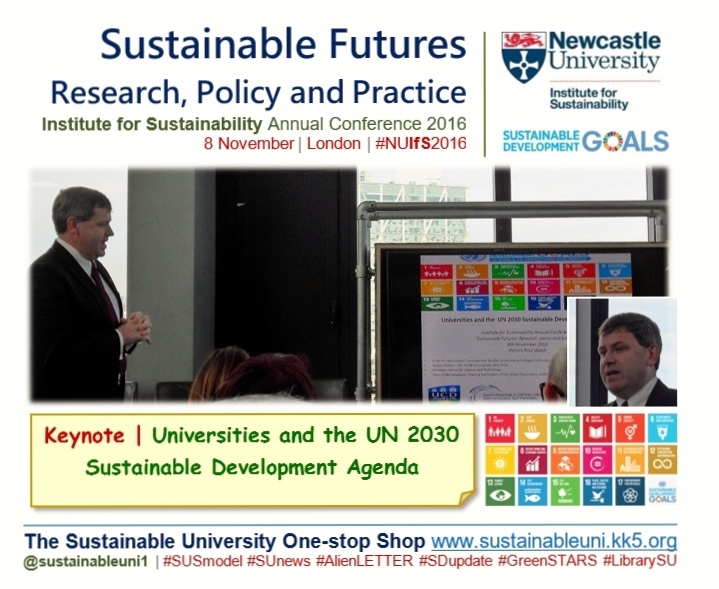 Launched in December 2011, the SU News website publishes news related to sustainability in higher education and Education for Sustainable Development (ESD), mainly with a UK focus. 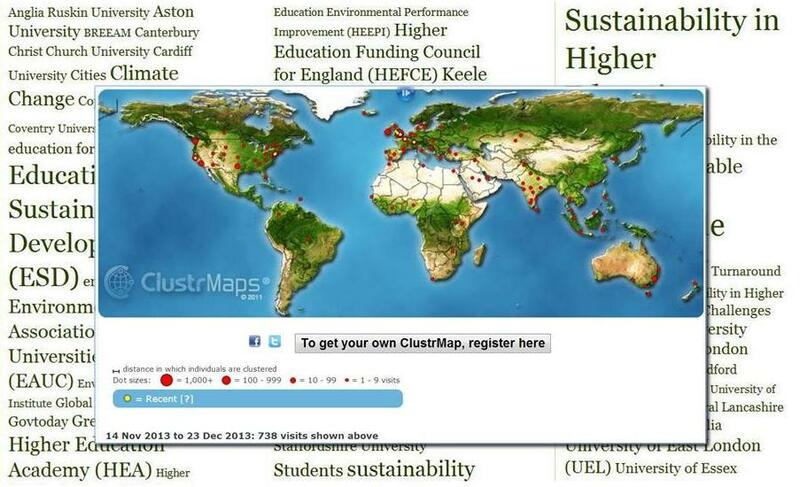 It is one of the seven satellite websites of The SU One-stop Shop (http://www.sustainableuni.kk5.org/), which has been recognised in Greening Universities Toolkit (http://www.unep.org/Training/docs/Greening_University_Toolkit.pdf, page 61) of The United Nations Environment Programme (UNEP). As on 29 December 2013, the SU News website has 149 posts and 8,270 views from around the world. The day and the month with most views are 28 March 2013 (96 views) and June 2013 (773 views). Recently, it has shown an increased growth in international readership. For example, on 14 November 2013, it started using ClustrMaps application that displays the location of visitors. This map shows that in the period 14 November to 23 December 2013 (40 days), the SU News website has attracted 738 views from all continents (please see map above). Launched in January 2011 as a single website, The SU One-stop Shop advances sustainability in higher education and education for sustainable development (ESD) worldwide through an integrated approach comprising education, communication, research, networking and motivation. Over the last three years, it has achieved 27,000 hits while growing into a web suite that comprises seven satellite websites: News & Information https://sunewsinfo.wordpress.com/, Research http://suresearch1.wordpress.com/, Good Practice http://sugoodpractice.wordpress.com/, Quotes http://suquotesfacts.wordpress.com/, Blog http://su-notes.blogspot.co.uk/, Diary http://esddiary.wordpress.com/ and Micro-blog (Twitter) http://twitter.com/sustainableuni1. Its social updates scheme ‘Sharing for a Sustainable World’ (#SSW) comprises eight updates, including sustainable development (#SDupdate) and climate change (#CCupdate). It has entirely been developed using free resources (free website builders and social networking).